The Battle of Alberta was host to some action on Friday night, but not the usual kind, as the Calgary Flames and Edmonton Oilers traded for just the second time in their history. The Flames acquired defenseman Ladislav Smid and goalie Olivier Roy from the Oilers in exchange for minor leaguers Roman Horak and Laurent Brossoit. Ladislav Smid, 27, a native of the Czech Republic and a veteran of 474 NHL contests, all with Edmonton. Originally drafted ninth overall by the Anaheim Ducks in the 2004 NHL Draft – Calgary took Kris Chucko, who retired due to concussion issues – Smid has developed into a reliable defensive defender. He’s not an offensive threat by any stretch of the imagination, his best offensive season boasts 15 points, but he’ll bolster the end-zone play of the Flames. Calgary’s missed Mark Giordano’s defensive coverage during his injury and with him likely out until Christmas, Smid fills a huge void. And once Giordano returns, Smid gives Calgary a lot of options in terms of how they deploy their blueliners. 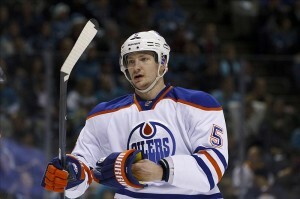 Smid is signed for three more seasons at a cap hit of $3.5 million. Olivier Roy, 22, is in the last year of his entry-level contract after being drafted by the Oilers in the fifth round of the 2009 NHL Draft. He had a strong junior career in the QMJHL, including a trip to the World Junior Championship, but hadn’t really solidified himself in the Oilers plans over the past two years. With good ECHL numbers with Stockton and decent but not great AHL numbers with Oklahoma City, Roy was a bit up in the air in Edmonton. He’ll start his tenure in the Flames organization with the ECHL’s Alaska Aces, with Joni Ortio and Joey MacDonald entrenched for now in AHL Abbotsford. 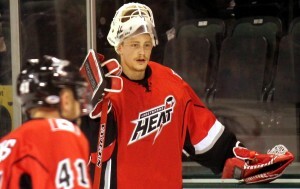 Roman Horak, 22, also a native of the Czech Republic and a veteran of 82 NHL contests, all with Calgary. Originally drafted by the New York Rangers in the fifth round of the 2009 NHL Draft (six picks ahead of Roy), Horak was traded to the Flames in the deal that sent Tim Erixon out of Calgary. A tad undersized but a tireless worker, Horak became entrenched in a weird spot in the Calgary forward pecking order – the first player recalled, but unable to make the NHL roster. With the acquisitions of Joe Colborne and Corban Knight, along with the emergence of Sean Monahan, Horak was bumped down the depth chart and probably wasn’t going to get much of a shot at the NHL in the Flames organization. Draft, Brossoit was an excellent (if slightly inconsistent) junior player who back-stopped the Edmonton Oil Kings to a WHL Championship in 2012 and was named playoff MVP. 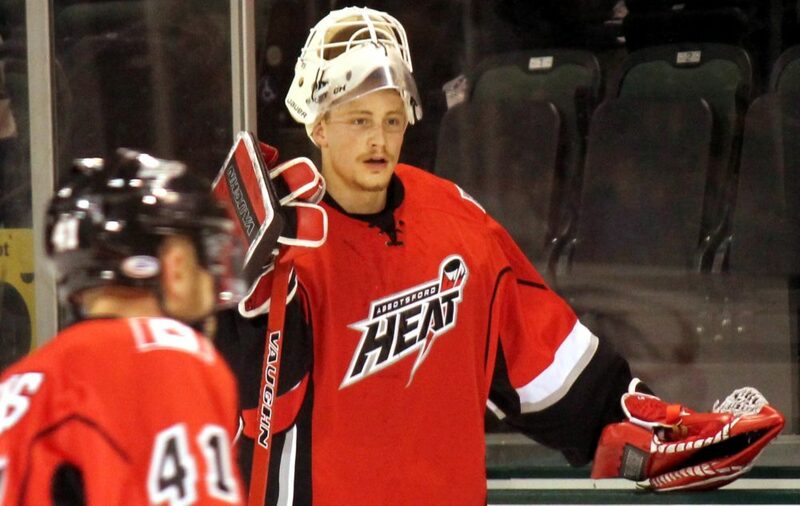 Like Roy, Brossoit has yo-yoed between the AHL and ECHL in his (brief) pro career. Unlike Roy, the Flames have NCAA standout Jon Gillies waiting in the wings and given Gillies’ arguably more-impressive collegiate and international resume, Brossoit may have been deemed redundant. He’ll get another chance in the Oilers system. Or maybe the Oilers just wanted to acquire yet another former Edmonton Oil Kings player. With Smid, the Flames add a similar player to Mark Giordano (albeit slightly younger and cheaper) while giving up two players that, while talented, were depth prospects in their system. They also add another goaltender to their system who can be used to pressure Joni Ortio a bit and hopefully push him to improve. After the move, the Flames have five NHL defensemen signed for 2014-15: Smid, Giordano, T.J. Brodie, Dennis Wideman and Shane O’Brien.